The S3 was the swan song of a remarkable 22-year run of success for the Stevens brothers, owners of the AJS marque, and one of their most unusual designs. The brothers were better known for simple but remarkably quick single-cylinder machines, one of which remains the only 350cc motorcycle to win both the Junior and Senior TTs, in 1921 with the legendary Howard R Davies aboard. Introducing a transverse v-twin of unique design into the maw of the Great Depression was truly unfortunate, for as Moto Guzzi has proved since the 1960s, a crossways twin with cylinders in the breeze is a sound design principle. While the S3 might appear to be AJS’ ‘normal’ sidevalve v-twin turned on its axis, it was in fact a completely new and innovative design. While the cylinders were laid at 50degrees, the camshafts were driven by a chain at the front of the engine, tensioned in the same manner as the OHC AJS racers, by a Weller tensioner. Those chains ran to the outside of the engine, driving camshafts directly underneath the valves, so no lifters were necessary. The cylinders of the 498cc engine used light alloy heads, held down by 7 studs, and hardly exceeded the width of the gas tank. While it might have seemed natural to use a shaft drive, AJS chose a spiral bevel gear at the back of the 3-speed gearbox to rotate the driveline, and used a fully enclosed chain run. All-up weight of the S3 was 353lbs, and power was sufficient for a maximum speed of 65mph, with fuel consumption at 60mpg. The unique AJS transverse twin was, like all AJS motorcycles, beautifully finished with a chromed fuel tank, diamond-shaped instrument panel, and lustrous black enamel everywhere else. The sale price of £65 included full electric lighting, toolbox, rear carrier, and leather-fronted panniers. 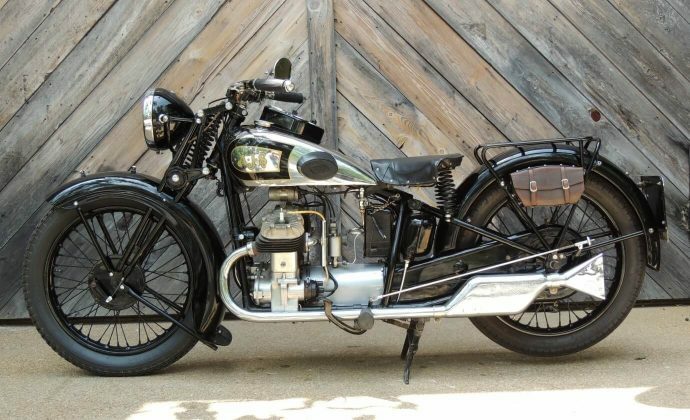 This 1931 AJS S3, #150379S, is a beautiful restoration of a very rare motorcycle. It was acquired from a New Zealand collector in 2009, and remains in exceptional condition.